Themistocles, who raised Athens from a subordinate position to her proud rank as leader of the Grecian States, was born about the year B.C., 514. He was the son of Nicocles, an Athenian of moderate fortune, who, however, was connected with the priestly house of the Lycomedae; his mother, Abrotonon, or, according to others Euterpe, was not an Athenian citizen; and according to most authorities, not even a Greek, but either a native of Caria or of Thrace. The education which he received was like that of all Athenians of rank at the time, but Themistocles had no taste for the elegant arts which then began to form a prominent part in the education of Athenian youths; he applied himself with much more zeal to the pursuit of practical and useful knowledge. This, as well as the numerous anecdotes about his youthful wilfulness and waywardness, together with the sleepless nights which he is said to have passed in meditating on the trophies of Miltiades, are more or less clear symptoms of the character which he subsequently displayed as a general and a statesman. His mind was early bent upon great things, and was incapable of being diverted from them by reverses, scruples, or difficulties. The great object of his life appears to have been to make Athens great. The powers with which nature had endowed him were quickness of perception, an accurate judgment of the course which was to be taken on sudden and extraordinary emergencies, and sagacity in calculating the consequences of his own actions; and these were the qualities which Athens during her wars with Persia stood most in need of. His ambition was unbounded, but he was at the same time persuaded that it could not reach its end unless Athens was the first among the Grecian States; and as he was not very scrupulous about the means that he employed for these ends, he came into frequent conflict with Aristides the Just, who had nothing at heart but the welfare of his country and no desire for personal aggrandizement. In the year 483 B.C., when Aristides was sent into exile by ostracism, Themistocles, who had for several years taken an active part in public affairs, and was one of the chief authors of the banishment of his rival, remained in the almost undivided possession of the popular favor, and the year after, B.C. 482, he was elected archon eponymus of Athens. The city was at that time involved in a war with AEgina, which then possessed the strongest navy in Greece, and with which Athens was unable to cope. It was in this year that Themistocles conceived and partly carried into effect the plans by which he intended to raise the power of Athens. His first object was to increase the navy of Athens; and this he did ostensibly to enable Athens to contend with AEgina, but his real intention was to put his country in a position to meet the danger of a second Persian invasion, with which Greece was threatened. The manner in which he raised the naval power was this. Hitherto the people of Athens had been accustomed to divide among themselves the yearly revenues of the silver-mines of Laurion. In the year of his archonship these revenues were unusually large, and he persuaded his countrymen to forego their personal advantage, and to apply these revenues to the enlargement of their fleet. His advice was followed, and the fleet was raised to the number of two hundred sail. It was probably at the same time that he induced the Athenians to pass a decree that for the purpose of keeping up their navy, twenty new ships should be built every year. Athens soon after made peace with AEgina, as Xerxes was at Sardis making preparations for invading Greece with all the forces he could muster. At the same time Themistocles was actively engaged in allaying the disputes and hostile feelings which existed among the several states of Greece. He acted, however, with great severity toward those who espoused the cause of the Persians, and a Greek interpreter, who accompanied the envoys of Xerxes that came to Athens to demand earth and water as a sign of submission, was put to death for having made use of the Greek tongue in the service of the common enemy. After affairs among the Greeks were tolerably settled, a detachment of the allied troops of the Greeks was sent out to take possession of Tempe, under the command of Themistocles, of Athens, and Euaenetus, of Sparta; but on finding that there they would be overwhelmed by the host of the barbarians, they returned to the Corinthian isthmus. When Xerxes arrived in Pieria, the Greek fleet took its post near Artemisium on the north coast of Euboea, under the command of the Spartan admiral Eurybiades, under whom Themistocles condescended to serve in order not to cause new dissensions among the Greeks, although Athens alone furnished one hundred and twenty-seven ships, and supplied the Chalcidians with twenty others; while the Spartan contingent was incomparably smaller. When the Persian fleet, notwithstanding the severe losses which it had sustained by a storm, determined to sail round the eastern and southern coasts of Euboea, and then up the Euripus, in order to cut off the Greek fleet at Artemisium, the Greeks were so surprised and alarmed that Themistocles had great difficulty in inducing them to remain and maintain their station. The Euboeans, who perceived the advantages of the plan of Themistocles, rewarded him with the sum of fifty talents, part of which he gave to the Spartan Eurybiades and the Corinthian Adimantus to induce them to remain at Artemisium. In the battle which then took place, the Greeks gained considerable advantage, though the victory was not decisive. A storm and a second engagement near Artemisium, severely injured the fleet of the Persians, but the Greeks also sustained great losses, as half of their ships were partly destroyed and partly rendered unfit for further service. When at the same time they received intelligence of the defeat of Leonidas, at Thermopylae, the Greeks resolved to retreat from Artemisium, and sailed to the Saronic gulf. Xerxes was now advancing from Thermopylae, and Athens trembled for her existence, while the Peloponnesians were bent upon seeking shelter and safety in their peninsula, and upon fortifying themselves by a wall across the Corinthian isthmus. On the approach of the danger the Athenians had sent to Delphi to consult the oracle about the means they should employ for their safety, and the god had commanded Athens to defend herself behind wooden walls. This oracle, which probably had been given at the suggestion of Themistocles, was now also interpreted by him as referring to the fleet, and his advice to seek safety in the fleet was followed. He then further moved that the Athenians should abandon the city to the care of its tutelary deity, that the women, children, and infirm should be removed to Salamis, AEgina, or Troezen, and that the men should embark in the ships. The fleet of the Greeks, consisting of three hundred and eighty ships, assembled at Salamis, still under the supreme command of Eurybiades. When the Persians had made themselves masters of Attica, and Athens was seen in flames at a distance, some of the commanders of the fleet, under the influence of fear, began to make preparation for an immediate retreat. Themistocles saw the disastrous results of such a course, and exerted all his powers of persuasion to induce the commanders of the fleet to maintain their post; when all attempts proved ineffectual, Themistocles had recourse to threats, and thus induced Eurybiades to stay. The example of the admiral was followed by the other commanders also. In the meantime the Persian fleet arrived in the Saronic gulf, and the fears of the Peloponnesians were revived and doubled, and nothing seemed to be able to keep them together. At this last and critical moment Themistocles devised a plan to compel them to remain and face the enemy. He sent a message to the Persian admiral, informing him that the Greeks were on the point of dispersing, and that if the Persians would attack them while they were assembled, they would easily conquer them all at once, whereas it would be otherwise necessary to defeat them one after another. This apparently well-meant advice was eagerly taken up by the enemy, who now hastened, as he thought, to destroy the fleet of the Greeks. But the event proved the wisdom of Themistocles. The unwieldy armament of the Persians was unable to perform any movements in the narrow straits between the island of Salamis and the mainland. The Greeks gained a most complete and brilliant victory, for they only lost forty ships, while the enemy lost two hundred, or according to Ctesias, even five hundred. Very soon after the victory was decided, Xerxes with the remains of the fleet left the Attic coast and sailed toward the Hellespont. The battles of Artemisium and Salamis occurred in the same year, B.C. 480. When the Greeks were informed of the departure of Xerxes, they pursued him as far as Andros, without gaining sight of his fleet, and Themistocles proposed to continue the chase. But he gave way to the opposition that was made to this plan, and consented not to drive the vanquished enemy to despair. The Greek fleet therefore only stayed some time among the Cyclades, to chastise those islanders who had been unfaithful to the national cause. Themistocles, in the meantime, in order to get completely rid of the king and his fleet, sent a message to him, exhorting him to hasten back to Asia as speedily as possible, for otherwise he would be in danger of having his retreat cut off. Themistocles availed himself of the stay of the Greek fleet among the Cyclades for the purpose of enriching himself at the cost of the islanders, partly by extorting money from them by way of punishment, and partly by accepting bribes for securing them impunity for their conduct. He was now, however, the greatest man in Greece, his fame spread everywhere, and all acknowledged that the country had been saved through his wisdom and resolution. But the confederate Greeks, actuated by jealousy, awarded to him only the second prize; at Sparta, whither he went, as Herodotus says, to be honored, he received a chaplet of olive-leaves--a reward which they had bestowed upon their own admiral Eurybiades--and the best chariot that the city possessed, and on his return three hundred knights escorted him as far as Tegea in Arcadia. When the Persian army had been again defeated at Plataea and Mycale in B.C. 479, and when the Athenians had rebuilt their private dwellings, it was also resolved, on the advice of Themistocles, to restore the fortifications of Athens, but on a larger scale than they had been before, and more in accordance with the proud position which the city now occupied in Greece. 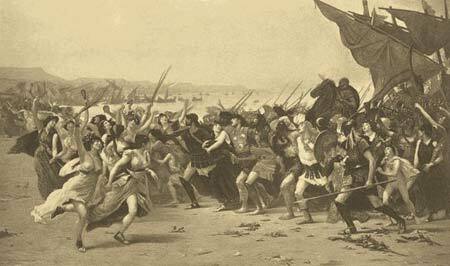 This plan excited the fear and jealousy of the rival states, and especially of Sparta, which sent an embassy to Athens, and under the veil of friendship, which ill concealed its selfish policy, endeavored to persuade the Athenians not to fortify the city. 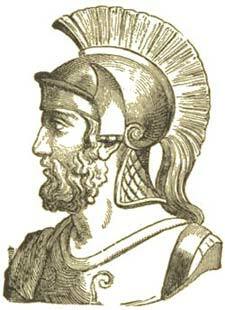 Themistocles, who saw through their designs, undertook the task of defeating them with their own weapons. He advised his countrymen to dismiss the Spartan ambassadors, and to promise that Athenian envoys should be sent to Sparta to treat with them there respecting the fortifications. He himself offered to go as one of the envoys, but he directed the Athenians not to let his colleagues follow him until the walls, on which all hands should be employed during his absence, should be raised to such a height as to afford sufficient protection against any attack that might be made upon them. His advice was followed, and Themistocles, after his arrival at Sparta, took no steps toward opening the negotiations, but pretended that he was obliged to wait for the arrival of his colleagues. When he was informed that the walls had reached a sufficient height, and when he could drop the mask with safety, he gave the Spartans a well-deserved rebuke, returned home, and the walls were completed without any hindrance. He then proceeded to carry into effect the chief thing which remained to be done to make Athens the first maritime power of Greece. He induced the Athenians to fortify the three ports of Phalerum, Munychia, and Piraeus by a double range of walls. When Athens was thus raised to the station on which it had been the ambition of Themistocles to place it, his star began to sink, though he still continued for some time to enjoy the fruits of his memorable deeds. He was conscious of the services he had done his country, and never scrupled to show that he knew his own value. His extortion and avarice, which made him ready to do anything, and by which he accumulated extraordinary wealth, could not fail to raise enemies against him. But what perhaps contributed more to his downfall was his constant watchfulness in maintaining and promoting the interests of Athens against the encroachments of Sparta, which in its turn was ever looking out for an opportunity to crush him. The great men who had grown up by his side at Athens, such as Cimon, and who were no less indebted to him for their greatness in the eyes of Greece than to their own talents, were his natural rivals, and succeeded in gradually supplanting him in the favor of the people. They also endeavored to represent him as a man of too much power, and as dangerous to the public. The consequence of all this was that in B.C. 472, he was banished from Athens by the ostracism. He took up his residence at Argos, where he was still residing when, in the same year, B.C. 472, Pausanias was put to death at Sparta for his ambitious and treacherous designs, and his fate involved that of Themistocles. The Spartans, in their search to discover more traces of the plot of Pausanias, found a letter of Themistocles from which it was evident that he had been acquainted with his plans. This was sufficient for the Spartans to ground upon it the charge that Themistocles had been an accomplice in his crime, and ambassadors were forthwith sent to Athens to demand that he should suffer the same punishment as Pausanias. This charge was no less welcome to his enemies at Athens than the discovery of his letter had been to the Spartans. Orders were consequently issued to arrest and convey him to Athens; and foreseeing that his destruction would be unavoidable if he should fall into the hands of his enemies, he fled to Corcyra, and thence to the opposite coast of Epirus, where he took refuge at the court of Admetus, king of the Molossians. On his arrival the king was absent, but his Queen Phthia received him kindly, and pointed out to him in what manner he might win the sympathy of Admetus. When the king returned home, Themistocles, seated on the hearth and holding the child of Admetus in his arms, implored the king not to deliver him up to his persecutors, who traced him to the court of the Molossians. It is stated that Themistocles was here joined by his wife and children. The king not only granted his request, but provided him with the means of reaching the coast of the AEgean, whence he intended to proceed to Asia and seek refuge at the court of the king of Persia. From Pydna he sailed in a merchant ship to the coast of Asia Minor. At Ephesus he received such part of his property as his friends had been able to wrest from the hands of his enemies at Athens, together with that which he had left at Argos. A few months after his arrival in Asia, Xerxes was assassinated (B.C. 465), and was after a short interval succeeded by Artaxerxes. Various adventures are told of Themistocles before he reached the residence of the Persian king. On his arrival he sent him a letter, in which he acknowledged the evils he had inflicted upon his predecessor; but at the same time claimed the merit of having saved him from destruction by his timely advice. He added that his present exile was only the consequence of his great zeal for the interests of the king of Persia. He did not ask for an immediate interview with the king, as he was yet unacquainted with the language and the manners of the Persians, to acquire which he requested a year's time. During this period he applied himself so zealously and with such success to these studies that at the close of the year, when he was presented to the king, he is said to have excited the jealousy of the courtiers, and was most kindly received by the king, to whom he held out prospects of conquering Greece by his assistance. The king became so attached to him, that Themistocles was always in his company. But death overtook him at the age of sixty-five, before any of his plans were carried into effect. Most of the ancient writers state that he put an end to his life by poison, or according to another strange story, by drinking the blood of a bull, because he despaired of being able to fulfil his promises to the king. The motive for his suicide is very questionable. Reflection on his past life and upon the glory of his former rivals at Athens, are much more likely to have rendered him dissatisfied with life. Before he took the poison he is said to have requested his friends to convey his remains secretly to Attica, and in later times a tomb which was believed to contain them existed in Piraeus. In the market-place of Magnesia a splendid monument was erected to his memory, and his descendants in that place continued to be distinguished by certain privileges down to the time of Plutarch.